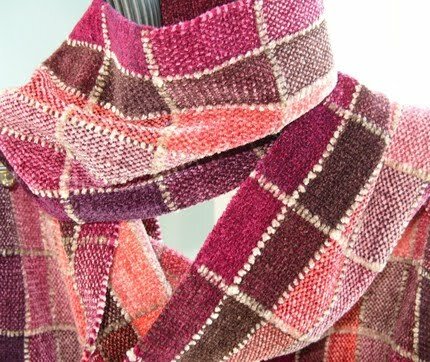 I loved the various shades of pink from this scarf for the Etsy Inspired Challenge and tried to replicate Barefoot Weaver's view of texture and look of windows with the patterned paper and paper edge distressing. 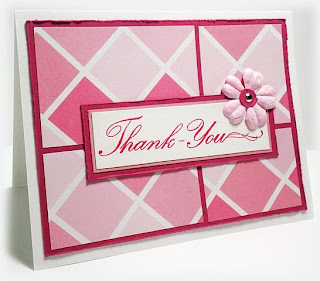 I chose a layout from Divine Coffee Break Designs and decided to use a Thank You sentiment for the latest Flourish's Timeless Tuesday. 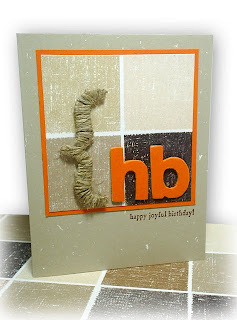 Making this card was a nice and quick break from the masculine ones I have been creating as of late. I'm on a mission to make some masculine cards for a gift. Any inspiration I can get is at least a boost in the right direction. This card was inspired by the Tuesday Trigger over at Moxie Fab World. I liked the different patterns in the leaves, the quilting and the tree itself but rather than just making a tree I decided to piece a collection of patterned paper together with the same kinds of colors from the inspiration pillow and "quilt" around the edges. 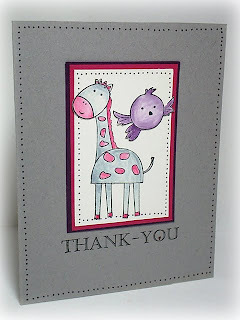 I shamelessly cased the design from the Splitcoast Stampers Inspiration Challenge found here. 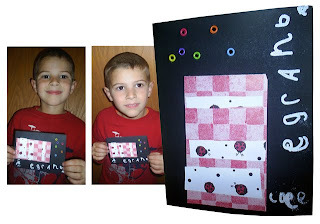 My son even said "Look Mama, your card is on the computer...." and I wasn't even finished making the card, because my inspiration picture was on the screen. Oh well, sometimes you need to go with the flow if you are inspired. 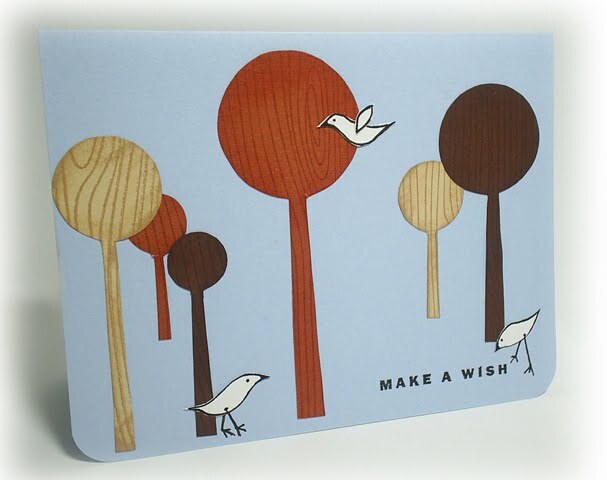 I loved how the trees are all woodgrain in the various wood tones against the blue background and how the white birds popped out from both. 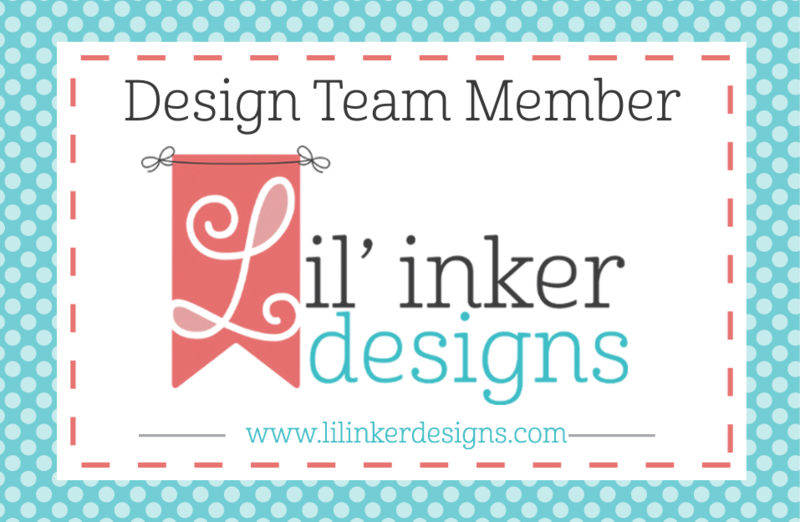 Here's a clean and simple card that can be easily mailed. This was my first try at the Etsy Inspired Challenge and my inspiration was found here-There is something about the graphic quality and colors of these flowers. This card came together really quick that I thought it would also make a great set in different colors for a gift. 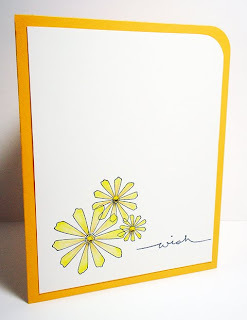 I also wanted a lot of white space and minimal layers, as Pals Paper Arts is having a KISS challenge (Keep it Simple, Sweetie) which is a lot of fun to see if I could incorporate both into a card. Here's my attempt at M's Sketch#4. I also used the colors from Color Throwdown #70 (Elegant Eggplant, Old Olive, Dusty Durango) and also my attempt at another masculine card. Not so sure what I think about the overall look of the card, but sometimes you have mojo and sometimes you don't-I think mine ran off somewhere and I need to find it again. Masculine cards are quite difficult for me. Perhaps it is because I have more stamps that lend themselves to girly, sweet thoughts, and hardly any that can be called manly. Perhaps it is because most masculine cards utilize colors that are out of my comfort zone. Or perhaps it seems that most guys just don't appreciate a handmade card? I'm not sure of the exact reason, but this card was certainly an internal challenge. 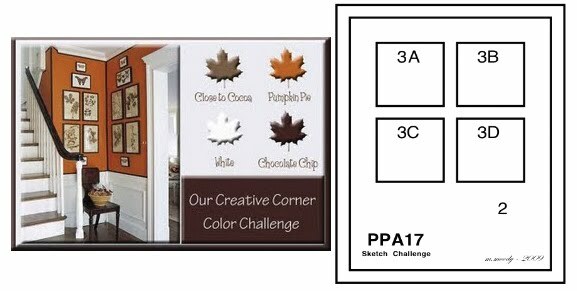 I received guidance and a starting point from the Our Creative Corner Color Challenge and the Pals Paper Arts Sketch Challenge. I thought that by adding the rough texture from the hemp twine wrapped around an acetate bracket that it would further reference some of what men are all about...rough, tough and tumble. How do you go about creating masculine cards, I'd like to hear some thought processes because I need to come up with a few more! Let's make a card, Cole. Ok, who for? Who do you want it to be for? Grandma Kathy, and I want a black one. Sure, what goes good with black? Hmm, red and white. How many dots does M have? Three. Ok, lets find something that can make three dots. How about these? Yes, those eyelets will make fine dots. How do we keep them on the card? With the Cropodile. 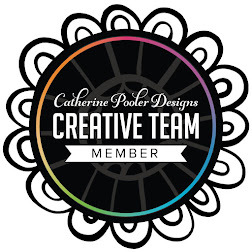 (Big brown eyes light up) I think we should make six dots because we have six colors. Ok, lets make six dots then. Cole, do you remember what these are called? Yeah, they are brads. Who is Brad again? No, not brads, eyelets. Oh yeah, and we put them on with the crocodile. Let's do some magic. (Big brown eyes light up) Grab the black marker and write Grandma's name on the card. (Intense concentration) Can I write my name too? Yep. Now we get the white powder and the heat gun. Mama? Yes, Cole. Papa says I shouldn't play with guns. Your Papa is right Cole, let's call this is heating tool, and you only use it with Mama. Ok, Mama. In Cole words, the card says his name on the bottom and his interpretation of "Grandma" along the side. Thank you, thank you, Savitri and M for giving me the opportunity to share my passion with my son. 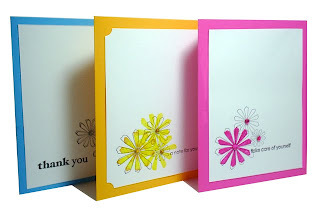 I realize that out of all my SU Stampin' Spots, the majority of my Bold Brights are not opened, and I've had them almost four years. The colors of the latest Embellish Magazine Challenge were truly a challenge for me to work with. The flowering brad button tree concept started when I pulled the only red, blue, green and yellow brads I had (the rhinestones). 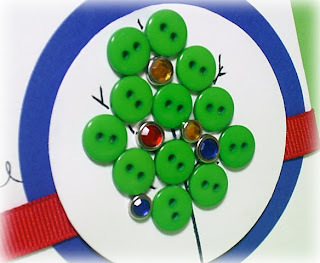 The green buttons came out next and just fell around the brads. Buttons are fun, (especially when they fall) and I've just started working with them. Since this is certainly the most buttons I've ever used on a card, I thought it would be good to email Paige at the Cards Blog for her latest endeavor, to use LOTS of buttons. Wish me luck! The card is shorter and thinner than a standard size to account for the knot by the yellow canary. I kept the remainder of the card simple so as to not distract from the tree. Navy blue, a bit of silver and Kraft? For some reason, I went with it (probably because Mrs. V. really likes navy blue, I already had Kraft out from my last card and the silver? well, that's the part I'm not so sure about...) The butterfly was stamped on linen white and then sponged with chalk. I love scallops, I think they add just the right amount of grace and sophistication. I think the overall design would have been a bit more dynamic had I used some dimension, but I did have to consider that this will be mailed across seven different states. The layout is based on the Timeless Tuesday sketch at Flourishes. I love finding challenges for the inspiration, but I so would love to win sometime at Flourishes just to have one of their awesome sets. 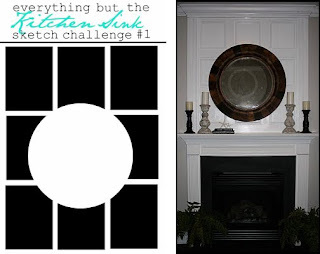 The brave butterfly slowly drifted down on the white-washed bricks to catch a quick rest... Everything but the Kitchen Sink has a great grid-like sketch challenge this time around that was inspired by one design team member's mantle. 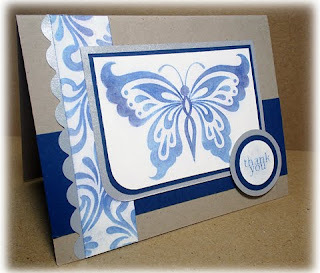 I was likewise inspired by the tone on tone effect that the molding created and wanted to replicate in the background of this card by dry embossing/scoring the rectangle panels. 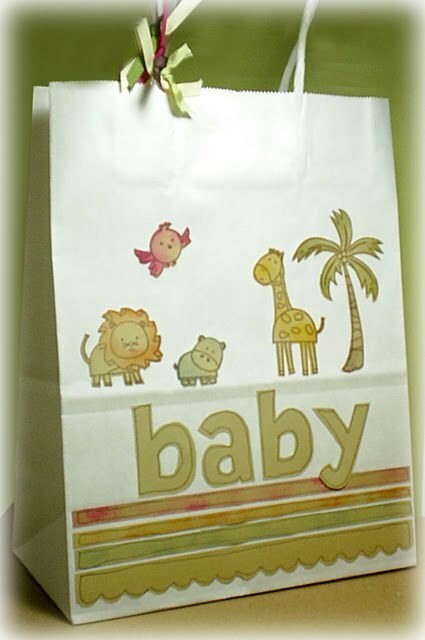 Oh how fun it is when babies are on the way! 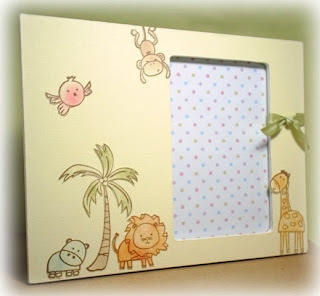 This is a bag and frame combo to go along with all the baby cards I've recently made. The mother is doing a "wild" theme for the nursery so I'm hoping that she can use the frame to house a most adorable picture of her little one. 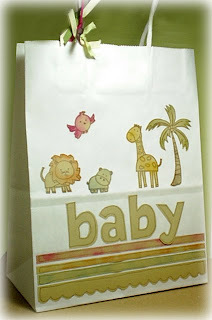 I'm just in time for the Timeless Tuesday Challenge at Flourishes which inspired me to make the bag to house the gifts. Here's the Goods: Altered mdf frame Michael's Craft Store, Mindy's Zoo stamps,Bazill textured paper, Chestnut Roan Ink, various Earth Elements SU inks and sponge daubers. I'm a EbtKS Domestic Diva! 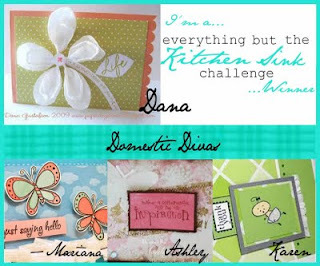 Wow, my toilet paper ruffle card received a Domestic Diva mention for the Everything But the Kitchen Sink Challenge (they have their very own blog now!) and I'm so VERY honored. Thank you! 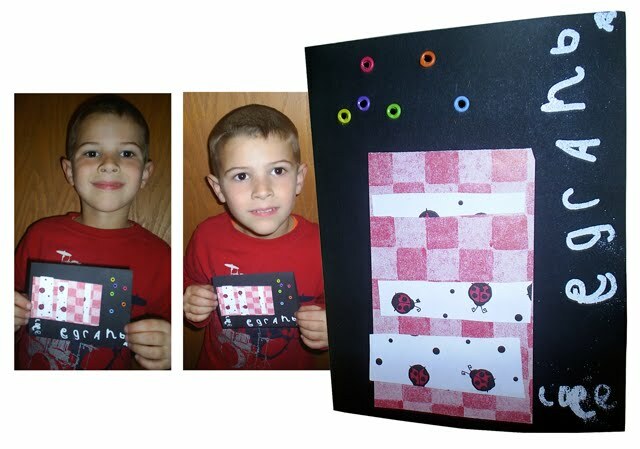 Please check out the winner and other cards here. You know that song from the Sound of Music-"Favorite Things"? 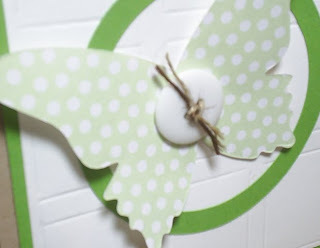 It makes for an awesome challenge and Flourishes has done that. My inspiration came from the line Raindrops on Roses and Whiskers on Kittens. My sister, the veterinarian, has all the kitten sets at her place, so...here's my card using the only rose set I have, which is SU's Both Way Blossoms. 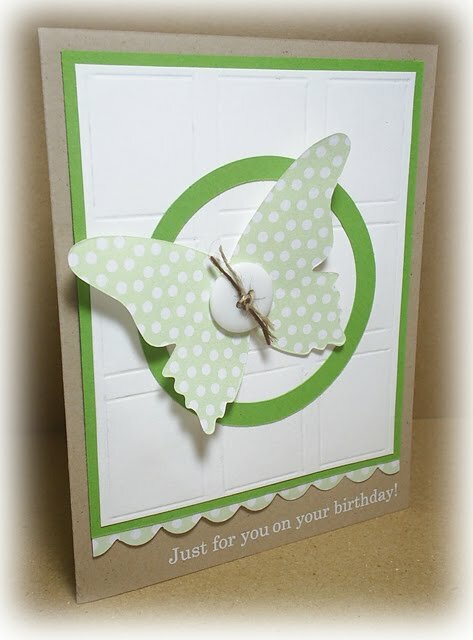 I tried for a shabby chic look with the sketch from Card Patterns by using some paper from K&Company and distressing the edges. There is faux stitching around the panels as well. The roses were spritzed with So Saffron and Rose Red before stamped in Chocolate Chip ink and covered with Crystal Effects. The "raindrops," although not exactly ON the roses, are RainDots that have been distressed a bit with Chocolate Chip ink before adhering. Coral owls lined up in a row, certainly celery woodgrain stamped down low, chocolate ribbon treatment for a bow... 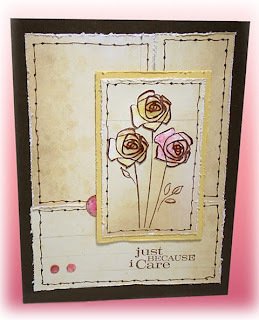 I had lots of fun making this one layer card for the Embellish Magazine Challenge. 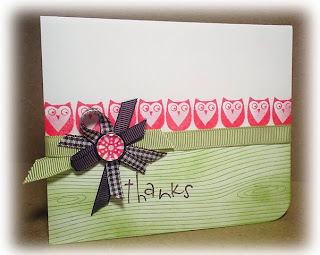 The challenge was to actually use owls, and the colors of coral, brown and green, but to vamp it up a bit, I challenged MYSELF to a one layer card. With the exception of the ribbon treatment, which is the wide grosgrain in green, 1/4 inch grosgrain in chocolate brown and checked all slid under a Build a Brad. Challenges are a great thing for me creatively, it gives me the starting point to make things I like, use things I might not, and hope to have a great card in the end. 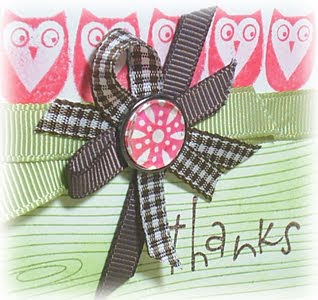 The owls are from Craft Affair and the Thanks, well, that is from my new favorite Heidi Grace Thank You set. Yep, toilet paper ruffles! 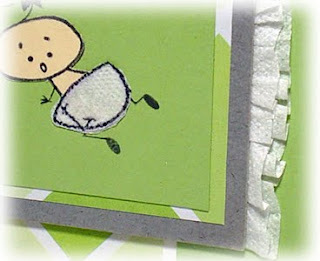 Everything but the Kitchen Sink challenged their readers to use toilet paper on a card so continuing with my Baby Card Thanks collection I thought that a baby in a diaper made out of toilet paper would be a cute way to use TP, and to soften the card a bit more I made a ruffle out of it as well. 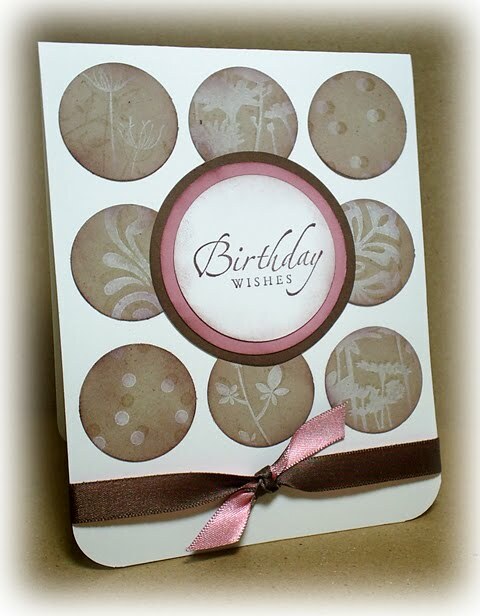 This card uses the Cupcake Inkadinkadoo Clear Stamp set, Heidi Grace Thank You set, DCWV designer paper and some random solid cardstock. This is also my entry for the Mojo Monday Challenge. Thought I'd show a close up of the ruffle (and the diaper), for some reason I'm really proud of it! Edited to add: sorry everyone for the incorrect link, I corrected my error and I hope that you were able to find this post again! 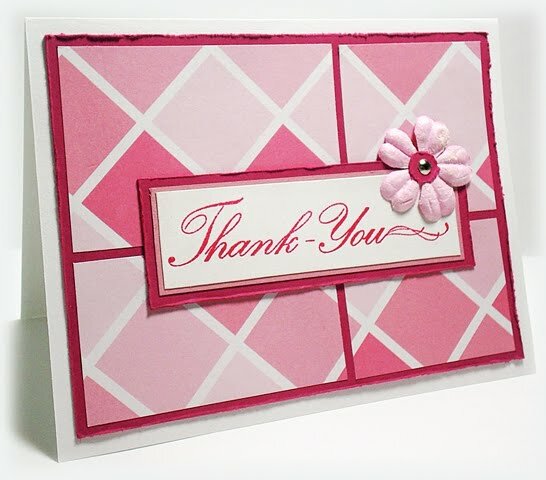 Here's my entry for the Pals Paper Arts Challenge, to create a card with Pink. 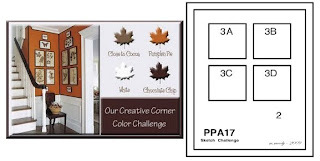 If you have time, check this challenge out-they always have great ideas! I am fortunate to say that I have only one acquaintance that is a breast cancer survivor. This card was created for a friend whose husband is going through a rough time and it will be meant to cheer her up and let her know that people do care for her as well. 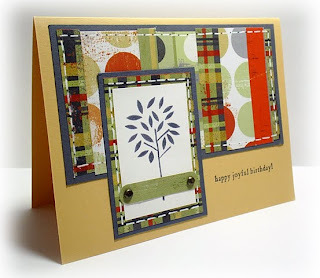 The background and trees are from Craft Affair. The trees were stamped on a pink paint chip, cut and raised with dimensionals. 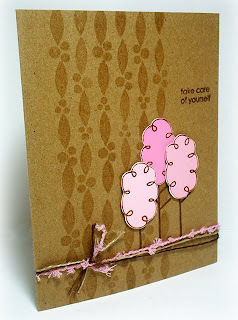 To add a bit more to this clean and simple card without trying to take away from the sincere message, I used linen tread in kraft and brown and some pink fibers I have had for a while. I have to admit that I didn't really know what a phoenix was until I read about them in Harry Potter, but now I'm drawn to their symbolism and magical power... 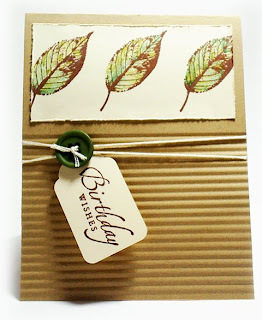 Although Brocade Basics the stamp set isn't exactly a phoenix, I thought the shapes of the leaves in the stamp set and the tails of the bird were quite similar. I tried to replicate the colors by stamping in versamark and then using a mixture of the golds, yellows and oranges in the chalk. 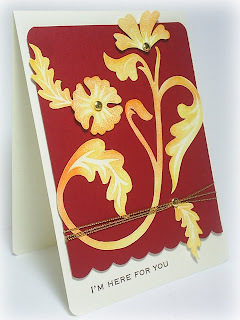 To add elegance to the card, I brought in some gold brads and gold cord. The sentiment is from SU's Chit Chat rub-ons. I've had them for quite a while and used a lot of them, but it still seems that there are a lot left! I started this card on Saturday night and didn't finish it until Sunday, some times I just have to take a break and eventually it will come out decent. My inspiration piece from the Franz Porcelain site is here. Trying my hand at the Color Throwdown Challenge using Bordering Blue, Rich Razzleberry (substituted by Rose Red) and Elegant Eggplant. I LOVE this challenge and the ladies there do such a great job. 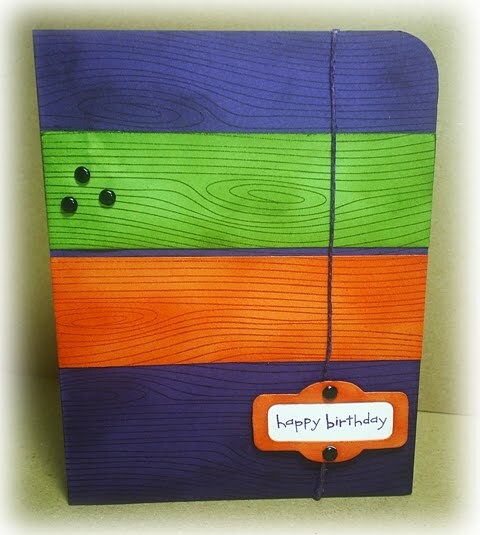 I didn't know if these colors would work for a baby card, but I really needed some more to add to my gift-I think it turned out ok, a nice gender neutral card. The stamps are from Mindy's Zoo (thanks Erin!) and the Heidi Grace Thank You Set.